The president of the Christian Action League of North Carolina, the Rev. 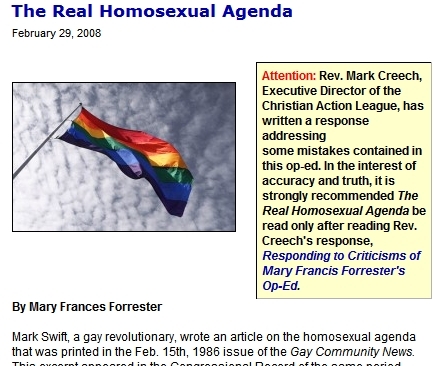 Mark Creech, has responded to my various criticisms of an earlier op-ed published on their website (“The Real Homosexual Agenda” Feb. 29, 2008) by Mary Frances Forrester, wife of anti-gay marriage amendment sponsor N.C. State Sen. Jim Forrester. 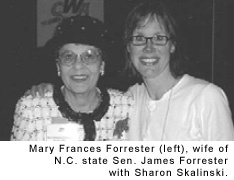 In his piece, “Responding to Criticisms of Mary Francis Forrester’s Op-Ed,” Creech satisfactorily addresses many of Forrester’s inaccuracies albeit without giving up on their own agenda, one awash with anti-gay prejudice and religious oppression. 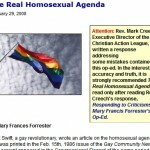 Only a few weeks ago, Mary Francis Forrester, wife of State Senator Jim Forrester, wrote an op-ed piece that the Christian Action League (CAL) posted: The Real Homosexual Agenda. Days afterward, the Christian Action League received more hits on its web site than at anytime before. Our tracking revealed most of those hits were coming from various homosexual web sites that had placed links to the piece. Along with the surge in hits to its web site, CAL also received a number of emails from angry readers who complained Forrester’s assertions were fraught with inaccuracies. Because, unfortunately, there were some inaccuracies in the writing, it becomes only proper those errors be addressed. Perhaps just as important, however, is also the need to respond to the obvious indignation expressed by the homosexual community against the op-ed. I would like to take the time to publicly thank Rev. Creech for taking time out of his own very busy schedule in order to write and research the response to my criticisms. Although he and I will, no doubt, continue to disagree on LGBT equality, I have respect for his willingness to enter into this dialogue. Unlike many of his colleagues, he has chosen to talk with me and discuss these issues openly and publicly. But again, I have to give credit where credit is due. Creech stepped up to the plate. He could have simply ignored the criticisms, but he didn’t. In fact, he even went as far as to post a disclaimer on Forrester’s original piece (click thumbnail at right for larger image). I thought that the last piece you did about the Christian Action League’s opposition to the lottery was unfair. If you think we should be fair, then that same standard should also apply to you. You noted in your article that I had said the reason people shouldn’t gamble is because the Christian Action League said so and factiously you added that should be reason enough. Nonsense! The article stated clearly the reason people shouldn’t gamble was because it emanated and fostered a spirit of covetousness, which is a violation of the tenth commandment. I don’t think the article could have been any clearer. That’ll also be posted on the original gambling post. Finally, let me say that I’m not going to respond to Creech’s response to my original response to Forrester’s piece (whew!). I’ve said my piece… Creech has said his. Fair is Fair.